The mission of the STAR Education Foundation of St. Croix Falls is to strive to enrich student lives and enhance education in an effort to ensure the success of our students. With that in mind, the STAR Foundation is proud to announce the winners of our first grant cycle, St. Croix Falls teachers: Mike Wilson, Denise Sinclear-Todd, Maria Gjovig, and Chris Wondra. Typically, STAR Education Foundation is interested in supporting targeted projects that deal with technology, student and staff enrichment, special equipment, and innovative teaching tools and materials that improve student achievement and development. Granting priority will be given to projects that impact a large percentage of the targeted population. $3,000.00 in total grant funds was available this grant cycle for student enrichment and we look forward to the next grant cycle in the fall!! St. Croix Falls high school guidance counselor, Michael Wilson, will use the funds for enhanced high school guidance curriculum technology. 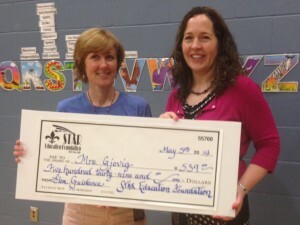 Mrs. Maria Gjovig, Elementary G uidance Counselor, was another recipient of a grant from the STAR Education Foundation this spring. We LOVE that Mrs. Gjovig is interested in thinking outside of the box and offering new opportunities for elementary-aged students. WAY TO GO MRS. GJOVIG! 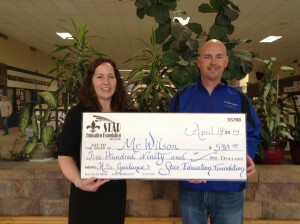 Rebecca Berg (right), President of the Foundation, is shown awarding the check. 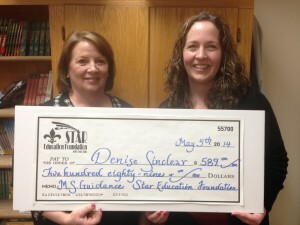 Mrs. Denise Sinclear- Todd was one of four recipients of a grant from the STAR Education Foundation this spring. 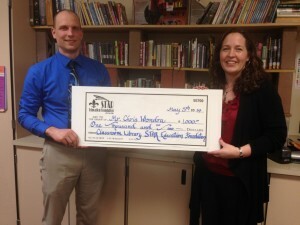 The grant will allow the purchase of an iPad to be used in the Middle School Guidance Department. The iPad will be used for additional student involvement in creating and presenting video lessons on units such as anti-bullying, decision making, social skills, character education and transition between schools. Students will be encouraged to take leadership roles with their input and production of videos on important school issues. Congratulations to Mrs. Sinclear-Todd!! Research has shown that rich classroom libraries support increased levels of student literacy. Mr. Chris Wondra was awarded a grant that will be used to acquire as many high quality, high interest books as possible to create an enriching classroom library for students to read and browse for interest and enjoyment, as well as coursework. Congratulations to Mr. Wondra! We’re proud to support his efforts to enrich the classroom experience for students.